Is it ever too early to start shopping around for life insurance for your baby? Baby life insurance is more than just coverage in case something terrible happens to your baby or child. Baby life insurance in the form of a whole life insurance policy like the Gerber Life Grow-Up Plan actually creates a solid nest egg for your child. The Gerber Life Grow-Up Plan cannot be canceled by the insurer for any reason, and your child will not be turned down for additional coverage through the plan, as long as premiums are paid. 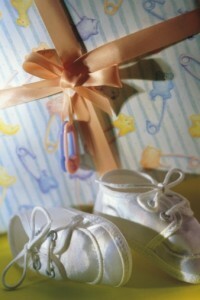 Baby Insurance: Another “New Baby” Expense? We know that having a baby has a lot of expenses associated with it. You need all that baby gear, clothing, and diapers. Child birth classes. Maternity clothes for you. Then there are the OB or midwife bills or insurance co-pays. You’ll also want to consider your own life insurance policy and possibly increase your coverage to accommodate your new family member. But people are always looking for unique baby shower gifts. Grow-Up can only be purchased by a parent or grandparent, so If a grandparent is looking for a unique baby gift (especially if this is your second child and you have all the requisite “baby stuff” you need), why not suggest they provide baby insurance for the little one on the way? You can also ask other friends or family to contribute with a donation to baby insurance premiums. Because, let’s face it, a baby insurance policy will have a lot more value in the future than another pink layette set.